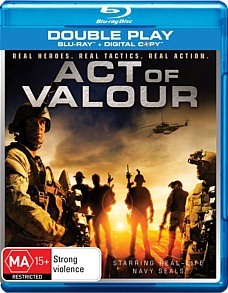 Act of Valour Blu-ray Review. Action films have every right to be mindless and cliché, but a film like Act of Valour cannot have this privilege, as it insists that it gives a true insight into what life as a Navy SEAL is; it’s far from it. Unintentionally cheesy and far too familiar, this is one “act of valour” no-one should take credit for. Are you one of those people who wondered if they were ever going to make a film based on the hugely popular Call of Duty video game franchise? Well, if you’re still hanging out for that to happen, why not pick up a copy of Act of Valour? Directed by Mike McCoy and Scott Waugh, this action war flick aims to put the viewer into a real life soldier’s shoes, starring actual U.S. Navy SEALs and crewman, in a race around the world to stop a dangerous terrorist mission. Judging from the trailers, I was expecting to see an extremely real and honest film about the struggles of war. After viewing Act of Valour however, I can easily say that it is one of the most cliché, predictable, and poorly made films I have seen this decade. The one thing the film gets wrong right of the bat is the bizarre choice to cast real Navy SEALs as the main characters. The acting on display here is nothing short of awful. Dialogue is delivered flat and dry, even by some of the trained actors, and symbolic messages are extremely obvious and pointless in some scenes. I can’t really blame the SEALs for their acting though, the blame should be targeted at McCoy and Waugh, who while filming a production for use by the Navy SEALs thought that using them in a multi-million dollar budget would be a good idea. Sadly, the idea doesn’t work. The sense of realism they attempt to execute through using real soldiers can be seen done right in films where no real soldiers were seen on screen, such as The Hurt Locker. The quality of the footage looks fairly decent; various filters are put to good use to make swampy marshes look dense and claustrophobic, and equatorial regions feel hot and barren. The camera work is a different story though. Nearly every scene contains a first person view of the scenario, from breaking into the enemy’s hideout to riding a bike through the city. It’s an obvious attempt of immersion, however from someone like me who frequently plays first-person shooters like previously mentioned Call of Duty; it feels more like the film is solely appealing to that audience. The film is a messy product because of this, an editor’s nightmare that turned out for the worse. The surprise feature about the release of Act of Valour on Blu-ray is the special features included on the disc. As well as having access to a digital copy of the film, there is commentary, deleted scenes, interviews with the Navy SEALS, trailers, music videos and more. There’s some definite value here if you’re a fan of the film. Action films have every right to be mindless and cliché, but a film like Act of Valour cannot have this privilege, as it insists that it gives a true insight into what life as a Navy SEAL is; it’s far from it. Unintentionally cheesy and far too familiar, this is one “act of valour” no-one should take credit for.